Despite headline rider and 2011 UCI world road race champion Mark Cavendish out recovering from injuries sustained at Milan-San Remo last month, there is no tarnishing the gleam from the smile of Sam Brand as one of 10 riders representing Isle of Man at the 2018 Commonwealth Games in Australia this week. The Gold Coast is abuzz with 71 nations competing in the Queen’s Games, and the 27-year-old former elite triathlete has already recorded a top 25 (22nd) finish during the men’s individual time trial (38.5km) won by Australian Cameron Meyer along the Currumbin Beachfront on Tuesday (April 10). 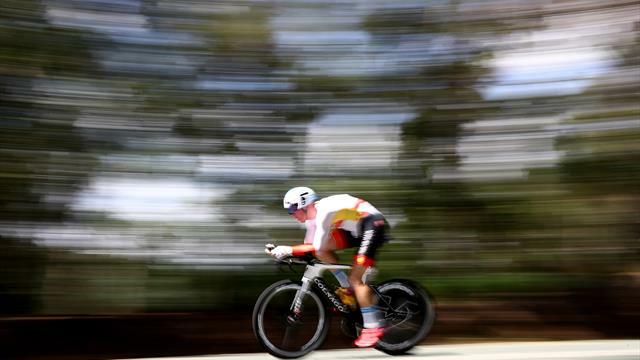 “I was feeling good heading in to the time trial,” Brand told Eurosport. “It’s been a busy few months to begin the season. An awful lot of travelling having raced in Abu Dhabi, Europe and Japan. The men’s 163.8km road race will start and finish at Currumbin Beach with the peloton to complete nine laps of the 18.2-kilometre course. And with the TT already under his belt, Brand is ready to welcome the road event. Five others join Brand on the men’s Manx squad, including Nathan Draper, Jake Kelly, Leon Mazzone and Tom Mazzone, with one noticeable exception being the absence of the ‘fastest man on two wheels’ for Saturday’s (April 14). “Our team was obviously headlined by Cav but without him we are still here to race and not to just make up numbers,” said Brand. “We have a great team and here to show that. “I’m over the moon to be here representing the Isle of Man. Doing so is a huge deal to me,” he continued. “To be here representing both the Isle of Man and Team Novo Nordisk is a dream come true. After having competed in two triathlon world championships for Great Britain, Brand, who was diagnosed with Type 1 diabetes at age 10, made the move to road cycling having joined Team Novo Nordisk as a stagiaire last year. However, this year Brand is racing on the main roster of the US-registered UCI Professional Continental squad — the first and only all-diabetic pro cycling team in the world —both an accomplishment and responsibility not lost on the Peel native. So much so, he even has reminders of his mission emblazoned on his bright red cycling shoes. “For me personally it is unbelievable,” he admitted. “The team’s mission to inspire, educate and empower is something that I want to achieve daily, whether that’s riding, speaking or through other means. “I am very passionate about it,” Brand continued. “It means the world to me to do what I do. Being here allows me to spread Team Novo Nordisk’s message throughout the Gold Coast, as well as Australia. “My shoes have been designed to empower those affected by diabetes by showing 50 names of people world wide that are affected by Diabetes. It’s much more than the 50 names, my aim was for them to be a beacon of empowerment and inspiration for the global diabetes community.